Growth in spending on cloud by certain sectors of the UK government looks to be coming to a juddering halt, according to information provided under Freedom of Information (FoI) and open data. And contrary to the rest of the world, where Amazon’s AWS is number one, it is Microsoft’s Azure that’s the market-share leader with UK Gov apparently having transferred its on-prem love affair with Redmond to cloud. The Ministry of Defence (MoD) and the Land Registry are among organisations that look set to spend less on cloud services in 2017-18 than in 2016-17, according to responses to FoI requests from The Register. Others including HM Revenue and Customs and NHS Digital have spent more than in the previous year, but high rates of growth appear to be a thing of the past. The MoD's data, covering its Information Systems and Services unit, provides a good illustration. Its Defence as a Platform Hosting Strategy of last autumn "principally supports the strategic goal of transforming Information Systems and Services and wider ICT provision from product based, to a service based model". In other words, it is signed up to cloud computing. This is confirmed by its spending: the MoD says it spent £5.93m on cloud computing in 2016-17, nearly six times more than 2015-16's £1.01m. But between April and December 2017 it spent just £2.03m*. HM Land Registry, which maintains the land and property ownership register for England and Wales, was already spending a lot on cloud, with £1.12m in 2015-16 and £1.14m in 2016-17. But in the first three quarters of 2017-18 it spent £769,000, suggesting it will commit a bit less across the whole financial year. But several that are increasing spending are doing so at a gentler pace than before. NHS Digital, which runs national information, data and IT services for the National Health Service in England, said that from April to December 2017 it had already spent £1.88m, more than 2016-17’s £1.34m. While it is heading for a substantial year-on-year increase, it will be less than the more than tripling in spending that took place from 2015-16 to 2016-17. Similarly, the Welsh Government reported cloud spending of £2.85m in the first three quarters of 2017-18, more than the £2.34m in 2016-17 – but that was more than 60 times as much as £37,000 it spent in 2015-16. The picture is confirmed by the open spending data from the government’s cloud computing G-Cloud digital marketplace. This takes a fairly broad definition of cloud computing, including services such as training and planning, but provides an overview. It shows steady rises in almost every quarter until the last quarter of 2016, when £247.6m went through the framework, 52 per cent more than a year previously. Then things changed, and October to December 2017 saw £250.6m spent through G-Cloud, up just one per cent year on year. The G-Cloud data includes Department for Work and Pensions (DWP) spending of £14.87m in 2015-16, £45.72m in 2016-17 and £34.75m in the first three quarters of 2017-18 – in response to an FoI request the DWP said to use its G-Cloud data. If the DWP carried on spending at that rate between January and March, the total would come to just over £46m – effectively level with last year. The DWP has followed the overall pattern of moving from acceleration to cruise control. So why is growth slowing down? Cloud is clearly maturing as an option for central government organisations, with many already using it at scale, meaning that there is no longer as much untapped potential. Organisations who provided information under FoI talked about cloud being a key part of their strategies. “HMRC’s vision is to deploy its major IT systems and supporting infrastructure services onto UK based hyper scale cloud platforms” said the tax collection agency, while DWP said it works in line with the Government Digital Service’s cloud-first design principles. But another reason may be that many parts of government are sticking to familiar IT services and suppliers as they adopt cloud computing. This is suggested by relative spending on Amazon Web Services (AWS) and Microsoft. Globally, Microsoft is a distant second to AWS on cloud infrastructure sales. For the UK government, the inverse appears to be true. Of the nine organisations that provided data, AWS accounted for 5 per cent (£854,000) of cloud spending in 2016-17 and 10 per cent (£1.38m) of the first three quarters of 2017-18. Microsoft scooped 23 per cent (£3.9m) of nine organisations’ 2016-17 spending and 37 per cent (£5.25m) of April-December 2017, including services bought through resellers. 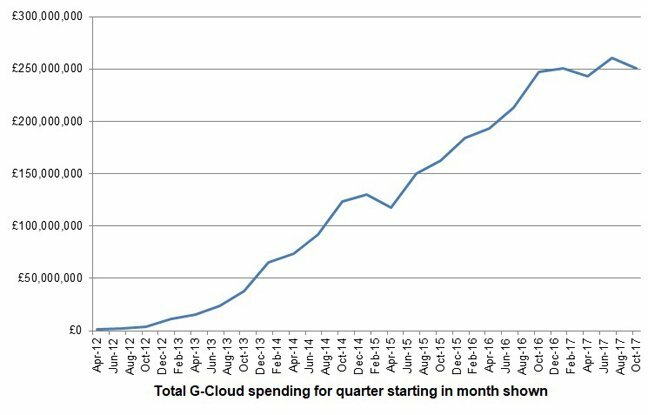 The G-Cloud data showed total spending with AWS of £4.85m in 2016-17, rising to £14m for April to December 2017, compared with Microsoft’s £7.24m in 2016-17 and £16.86m in the first three quarters of 2017-18. Microsoft was particularly popular with smaller organisations, often taking all or most of their cloud spending. The Welsh Government only reported its cloud spending with Microsoft, saying it was not able to determine how much went to other suppliers. NHS Digital spent £751,000 on Office 365 and £535,000 on Microsoft Azure in 2016-17, compared with just £55,000 with AWS that year, although the latter had doubled to £110,000 for the first three quarters of 2017-18. The Northern Ireland Executive’s IT Assist shared service, run by its Department of Finance, gave Microsoft all of the £29,514 it spent on cloud services between April to December 2017, including platform as a service “for development and test environments, with a small number of Office 365 licenses in use”. Kent County Council – the UK's largest council by population covered – put most of the £18,528 it spent on cloud in that period Microsoft's way, including all for its corporate functions, although it uses AWS as the main supplier for its EiS IT service for schools. Other larger organisations are working to reduce their dependence on AWS. Great British mapping agency the Ordnance Survey, which uses cloud services for "both platform as a service and infrastructure for the development, test and production running of our internal (staff and organisation) and external (customer) facing systems and services," spent £670,000 (94 per cent) of its cloud budget with AWS in 2015-16 but this was down to £520,000 (54 per cent) for April-December 2017, with Microsoft taking the £450,000 balance. Bigger departments are not so reliant on Microsoft, but are keen to diversify their cloud spending. HMRC uses multiple cloud hosting providers to reduce costs, a policy that has been blamed for Mancunian cloud service provider DataCentred going out of business last August. However, HMRC spent £1.22m with DataCentred in the first three-quarters of the 2017-18 financial year, more than the £916,000 it spent in all of 2016-17. UKCloud, which provides services exclusively to the UK public sector, appears to have suffered more at the hands of HMRC’s diversification policy. In 2016-17 HMRC spent £4.31m with the company, 79 per cent of all its cloud spending. For the first three quarters of 2017-18 this was down to £2.63m, just 47 per ent, although it remained its largest cloud supplier, followed by DataCentred. They were followed by AWS, which having earned just £1,579 in 2016-17 went to £609,000 (11 per cent) in April-December 2017. Other companies enjoying big increases over the same period include SystemsUp (£588,000, 10 per cent share in those nine months) and Cloudreach (£470,000, eight per cent) both a multiple of what they earned in the previous year. Open spending data for the first two months of this year suggests HMRC is buying into AWS in a big way, having already spent £2.85m. This includes £703,000 for "AWS G Cloud Deployment Program - Project Development" and the same amount as a prepayment for services. The two months also record payments to SystemsUp and Cloudreach – but nothing for UKCloud. Meanwhile, the MoD spent much of its cloud budget with specialist suppliers, the largest being Crown Hosting Data Centres, a joint venture between the Cabinet Office and Ark Data Centres used by UK public sector clients, which received £2.16m (36 per cent) in 2016-17. Other big suppliers were Commerce Decisions, a division of QinetiQ (£2.15m in 2016-17) – although this supplier did not receive anything from the MoD in the first three quarters of 2017-18 – and SecureCloud+, a defence and public sector focused supplier (£1.36m, 23 per cent). AWS earned all of £17 from the MoD in 2016-17, rising to £32,000 for April-December 2017. The DWP's G-Cloud spending – which as noted include services that go beyond a narrow definition as cloud computing – is similarly diverse. Between April 2016 and December 2017, the largest supplier was FDM Group (£7.46m in 2016-17, £4.47m in first three quarters of 2017-18); Capgemini (£1.3m in 2016-17, £9.73m in first three quarters of 2017-18); Deloitte (£8.64m in 2016-17, £664,000m in first three quarters of 2017-18); and Advanced (£2.26m in 2016-17, £6.22m in first three quarters of 2017-18). AWS received just £478,000 in 2016-17 and £1.45m between April and December 2017-18. Large public sector organisations often prefer to use a range of specialist suppliers, particularly those such as the MoD with particular security requirements, and that applies to cloud as much as anything else. Smaller ones tend to be conservative – which often means sticking to Microsoft. These factors may limit Amazon’s ability to sell cloud services to UK government organisations, but may also limit what those organisations do with cloud. As well as open data, this article is based on Freedom of Information requests to four Whitehall departments and three agencies – all major IT users – the UK’s three devolved national administrations and two of its largest local authorities. (The Home Office refused to provide data on security grounds, Birmingham City Council because of outsourcing its IT to Capita. * We asked for information in January – it took some organisations more than two months to provide a useful response – which is why the data covers to the end of the calendar year rather than the full 2017-18 financial year.